Receding gums can make your teeth appear longer and set the stage for many oral health problems. If you’ve noticed that you have receding gums, it’s time to head to your dentist. Although receding gums won’t go back on their own, your dentist can pinpoint the cause to help you stop your gums from further recession. Improve your oral hygiene to prevent receding gums. Brushing twice a day, flossing daily and seeing your dentist on a regular basis are the foundation to good oral hygiene. When you don’t take care of your teeth, it can create a lot of buildup on your teeth. Your gums can pull back to run away from the buildup and bacteria that are on your teeth. Crooked teeth and grinding promote gum recession. If your teeth aren’t in alignment or you have one tooth pushing out from the rest, it can cause a lot of recession. Grinding your teeth is another culprit. The good news is that both conditions can be treated. Patients have many options to straighten their teeth. For grinding, patients can wear a night guard. 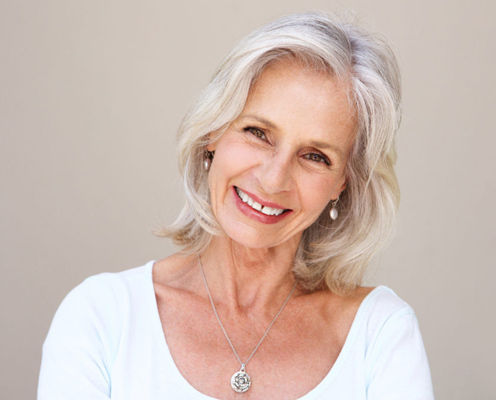 It’s important to stop gum recession before it becomes severe. Reconsider that tongue or lip piercing. Gums are very sensitive to anything that’s irritating them. Chronic irritation from a metal piercing will make your gums pull away in response to the contact. Perhaps the biggest reason people have receding gums is that they brush too hard. Try using only two fingers to hold your toothbrush. That’s all the pressure you need. If it’s difficult to do this with a heavier, powered toothbrush, use one that has a sensor alert to let you know if you’re brushing too hard. Receding gums cause more than cosmetic problems. If you have gum disease, receding gums can make it worse. When the gums recede, you’re also more susceptible to tartar and decay. Gum recession exposes the root of the tooth making that area much more likely to get a cavity. You may also notice some sensitivity when you drink something cold. Prevent receding gums to avoid surgery. Unfortunately, your gums will not go back to where they were once they recede. In severe cases, you may need to see a periodontist for surgery. The procedure entails taking tissue from your mouth to cover the area that’s receded. Ideally, you should see your dentist regularly so that problems like receding gums can be caught early. It’s much easier to prevent and stop receding gums than it is to fix them. 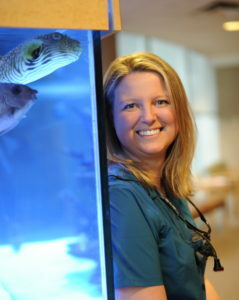 Dr. Krystie Niver sees patients at Konikoff Dentistry’s Lynnhaven office in Virginia Beach. You can schedule an appointment online or by calling 1-800-SMILE-23.